A word translated in the A. V. by "badger." Taḥash-skins were used in making the outer covering of the tent of meeting (Ex. xxvi. 14), and covers for various utensils used in the Tabernacle: for the Ark of the Covenant (Num. iv. 6), the showbread table (ib. iv. 8), the candelabrum (ib. iv. 10), the golden altar (ib. iv. 11), and the altar (ib. iv. 14). They were used also in the making of sandals (Ezek. xvi. 10). The Targum on Ex. xxv. 5 translates "taḥash" by "brilliant"; the Septuagint reads ὑακίνθινα = "hyacinth-colored"; the Vulgate, similarly. 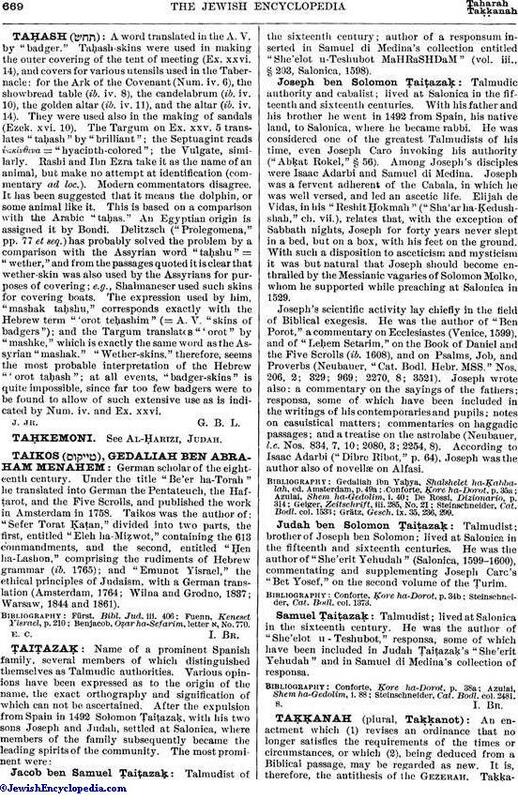 Rashi and Ibn Ezra take it as the name of an animal, but make no attempt at identification (commentary ad loc.). Modern commentators disagree. It has been suggested that it means the dolphin, or some animal like it. This is based on a comparison with the Arabic "taḥas." An Egyptian origin is assigned it by Bondi. Delitzsch ("Prolegomena," pp. 77 et seq.) has probably solved the problem by a comparison with the Assyrian word "taḥshu" = "wether," and from the passages quoted it is clear that wether-skin was also used by the Assyrians for purposes of covering; e.g., Shalmaneser used such skins for covering boats. The expression used by him, "mashak taḥshu," corresponds exactly with the Hebrew term "'orot teḥashim" (= A. V. "skins of badgers"); and the Targum translates "'orot" by "mashke," which is exactly the same word as the Assyrian "mashak." "Wether-skins," therefore, seems the most probable interpretation of the Hebrew "'orot taḥash"; at all events, "badger-skins" is quite impossible, since far too few badgers were to be found to allow of such extensive use as is indicated by Num. iv. and Ex. xxvi.